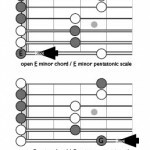 When learning the guitar pentatonic scale patterns, use pattern one to determine your root and key and then connect the remaining pentatonic patterns from there. In Fretboard Theory Chapter 4 you can learn where the roots are in the other pentatonic patterns. I even illustrate each position’s reference major and minor chord shape so that you can jump into the correct pentatonic pattern from any position or chord. The first note in pattern one is your minor root, the second note in pattern one is your major root. 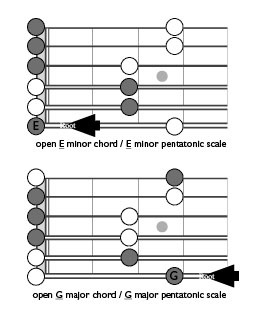 In the image example, use this pentatonic scale to play over either an E minor chord or progression revolving around E minor, or a G major chord or a progression revolving around G major. To learn more about music theory for guitar, including scales, chords, progressions, modes, and more, sign up for a free preview of my Fretboard Theory books and DVDs by using the form on this web page. If you have a question or comment you’re welcome to post it below.